Amid sweeping regulatory change, today’s financial services institutions must grapple with capital management, business risks and global growth — all while meeting greater demands for transparency. In light of increased competition, market volatility and demands for transparency, today’s global asset managers need to rethink their business models. Turn to our Global Wealth & Asset Management Center for insights on addressing regulatory challenges, growing assets, mitigating risk and enhancing performance. Unprecedented regulatory changes and demands are challenging global banks’ path to growth and profitability. Whether your goal is to manage risk, ensure compliance with new rules, improve operating models or raise capital, our Global Banking & Capital Markets Center can help you adapt to the new rules of the road so that your organization can reach its full potential. How is digital disruption transforming businesses? Digital transformation is changing our business environment. A robust digital strategy is thus crucial. Our latest study explores how digitization impacts businesses across sectors. Learn more. Eurozone Forecast: Outlook for Financial Services – Spring 2014 Our Spring Outlook for Financial Services forecast looks at what the latest financial developments mean for the region's banks, asset managers and insurers. Learn more. Global Banking Survey 2012 How do banking customers feel about their banking relationships? We asked more than 28,000 retail banking customers across 35 countries what they like, expect and want in the future from their banks. Learn more. The EY FinTech Hub will connect the FinTech ecosystem and bring awareness to the community, while providing innovative solutions to corporate entities. The Indian economy has expanded in the last quarter at its fastest pace in recent times with the GDP growing at 8.2%. Is innovation a mindset or skill set? 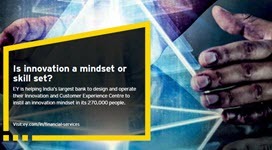 EY is helping India’s largest bank to design and operate their Innovation and Customer Experience Centre to instil an innovation mindset in its 270,000 people. Is Digital Banking the answer to financial inclusion? Our technology advisory team is helping a leading microfinance organization to transform into a Small Finance Bank. We are deploying our digital capabilities to deliver a compelling customer experience for this bank. Our team is also implementing several other projects to accelerate digital banking in India. The awards recognize and reward banks and bankers who are forerunners and trend setters in banking technology. Know more. The report lists 10 trends that could drive the Indian auto and auto financing markets. It also highlights the role of NBFCs and captives. Contact a member of EY’s Financial Services team.